This weekend I set out to create a pumpkin cookie that was soft and cake-like. And hopefully next weekend I can create one that is crispy--is there such a thing as a crispy pumpkin cookie? I got a ton of requests for pumpkin this and that. Amazed at how many of you love your pumpkin. Did you see my version of NY style pumpkin crumb cake? Or my pumpkin-nutella fudge puddles? 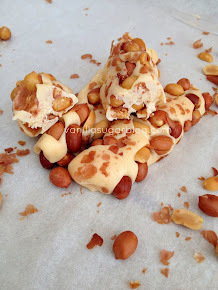 So, if you love cake-like cookies, then this one is for you. It's soft and a bit chewy. The best part is the frosting. 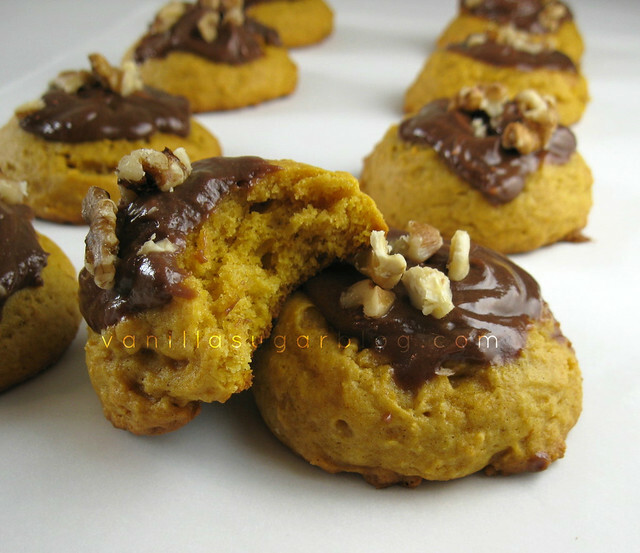 Hands down Nutella pairs really well with pumpkin. So if you're going to make pumpkin anything make sure to add some nutella in there. Really sticky dough. Make sure to chill the dough before using. Make sure to use a small or medium ice cream scoop. I used medium and got about 28 cookies. If you use a smaller scoop you might get 35 cookies? Combine flour, baking powder, baking soda, all the spices, and salt; mix and set aside. In a medium bowl, cream together butter and sugar. Next add in the pumpkin, egg, and vanilla extract, beat until creamy. Then add in the dry ingredients. Mix until just combined—do not overmix! Cover the batter and chill for at least an hour or overnight. 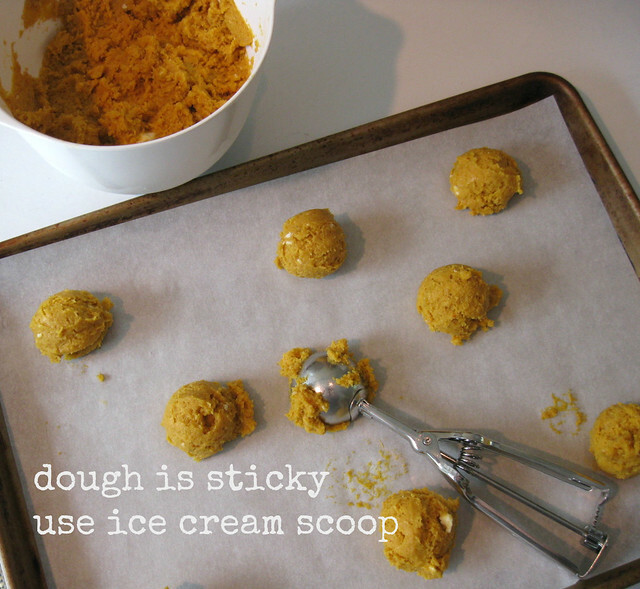 Using a medium or small ice cream scoop, drop on baking sheet, leaving about 2 inches space per cookie since these do expand when baking. I did not flatten then, I kept them as balls to ensure a soft cookie. Bake about 15 - 18 minutes. To tell if the cookies are done the tops will be set and the bottom slightly browned. cream butter, cream cheese and Nutella together. Slowly add in the powdered sugar and mix well. Let cookies cool completely before frosting. After you’ve frosted them you can decorate the tops with crushed pecans or walnuts. I like pumpkin everything. I'm actually baking pumpkin muffins as I type this! I'm not sure about crispy? Pumpkin adds SO much moisture, its hard to get crispy!! "-is there such a thing as a crispy pumpkin cookie? 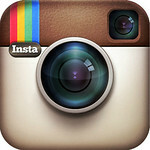 Have you had one?" I tried to create a chewy pumpkin cookie for my kitchenaid giveaway and I succeeded in making it chewy, not just soft and cakey. It's not crispy, but it's chewy. Like a choc chip cookie meets pumpkin cookie but BOY did I trial recipes about 17 times getting there. Pumpkin cookies are just inherently...soft! I loved the pumpkin whoopie pies I just made but your idea with nutella, even better! Just bought my first can of pumpkin for the season. Love the cakey nature of the cookies. I love cakey pumpkin cookies! I've never had a crispy pumpkin cookie, but I'm definitely up for one if you come up with a recipe. Mmm, those look good! Must try! In my experience, all pumpkin cookies come out cakey, although Jessica of How Sweet swears to have a chewy cookie though I've never tried it! 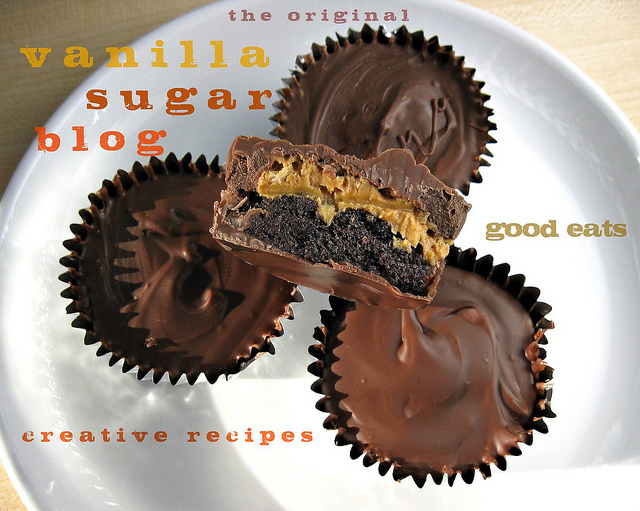 No matter what the texture, if you top it with nutella, I'm guaranteed to love it! I'm itching to do something w pumpkins. These cute li'l critters look like they just might be what I'm lookin' fer! you just made pumpkin even better. FYI: Once we both get our health situations straightened out, you and I will need to do plenty of jogging cause just looking at your recipes is making me chunky - like a choc chunk cookie. 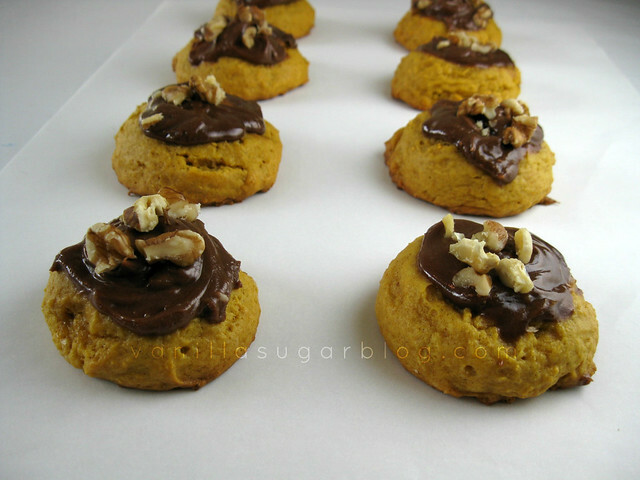 I can't get enough pumpkin this time of year and these cakey cookies look wonderful. Chocolate goes so well with pumpkin and I bet the Nutella takes it over the top! 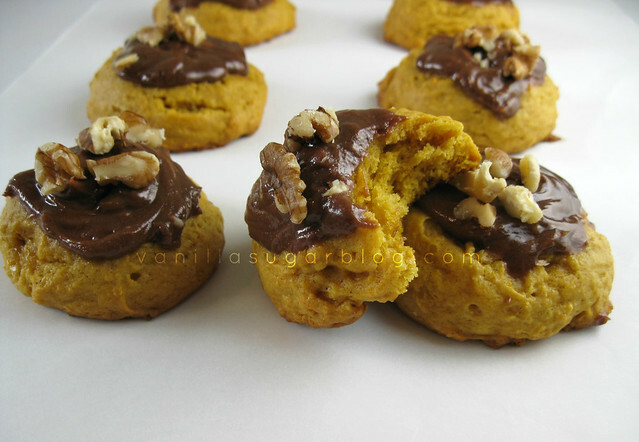 Yum, I really like pumpkin and nutella together - I would inhale these! 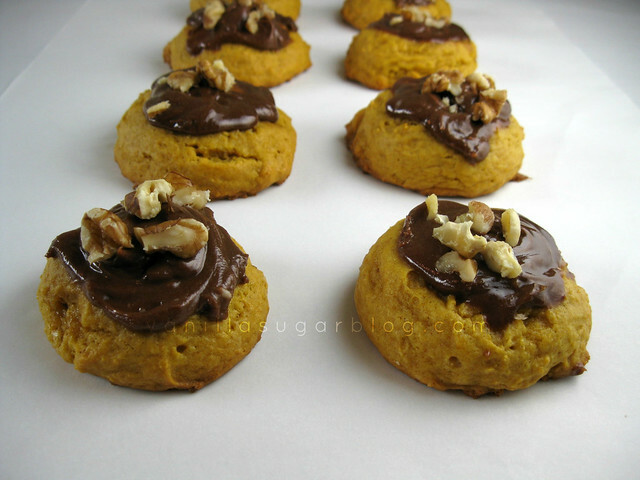 Pumpkin and chocolate were made for each others and these look so good!